According to the local tourist magazine Clearwater is “the US city with the highest rate of lightning strikes per capita”. First off who sat down and decided to figure that statistic and second it certainly doesn’t want to make me stay. 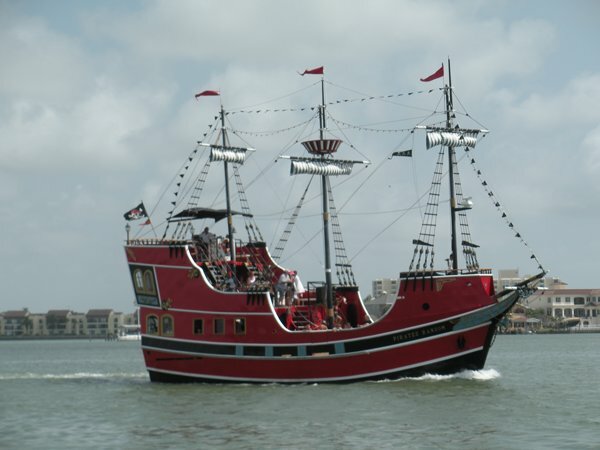 There are pirates in Clearwater and I’m not talking about West Marine. As we came into the channel we had to let this guy pass. I was hoping he would throw us some beads, but that didn’t happen. We walked around the beach today – beautiful beaches and the required number of T-shirt shops. We went for a swim and basically did nothing. Here is Roberta relaxing. One of the annoying things is the closeness of the fuel dock, but how far we have to travel to get there. Here is a picture from our dink just after leaving the fuel dock, in the distance is our boat. Note the low bridge. 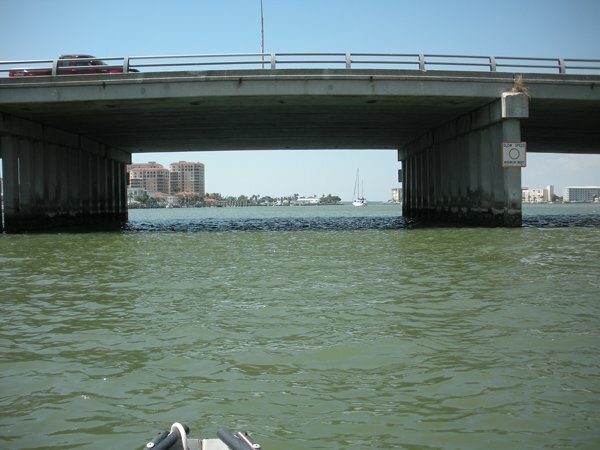 It’s about 4 miles to the fuel dock if you can’t get under the bridge. One of the jobs I’ve been meaning to do is spray my hand tool with a corrosion preventative spray. I know it won’t prevent the rust but perhaps slow it down. Anyway I had the can in a locker next to my bag of tools and during one of the offshore rocking and rolling periods something fell on top of the spray can (no top on the can) anyway I have one less thing on my to do list. I’ll bet it will be a long time before that locker rusts too. Tomorrow is another day on Clearwater beach and Thursday we are off to Ft Myers.